The process of long division by hand let's you solve the problem of division. Doctors have a standard procedure for diagnosing many types of illnesses, starting with the symptoms. A nation's constitution specifies how a country manages itself, in order to optimize the common good of its people. Robert’s Rules of Order specify the rules of palamentary procedure and debate, to achieve the goal of high quality decision making. All of these are a much better way of achieving a goal than no process or the wrong process. Without a process that fits the problem, a problem solver working on a difficult problem faces near certain failure. It's the reason all the processes listed above are so common. Science was not science until it had a process that fit is problem: the Scientific Method. Business could not grow beyond a certain size and complexity until it had a process that fit its fundamental problem: how to manage the flow of money. The problem was solved by invention of a process that fit the problem: double entry accounting. The life sciences could not become productive until Charles Darwin discovered the process of evolution. It consists of three cyclic steps: replication, mutation, and survival of the fittest. 1. Identify the problem to solve. 3. Use the process to hypothesize analysis or solution elements. 4. Design an experiment(s) to test the hypothesis. 6. Accept, reject, or modify the hypothesis. 7. Repeat steps 3, 4, 5, and 6 until the hypothesis is accepted. 9. Continuously improve the process as opportunities arise. Yet despite the critical importance of choosing an appropriate process, most environmental organizations do not follow a formal problem solving process to achieve their objectives. Instead, they use an intuitive approach consisting of whatever steps seem necessary at the moment. Because the process is not written down, it cannot be communicated, improved, or even followed efficiently. As a result, the process tends to never become mature enough to solve anything but easy problems. But try to tell this to the average environmentalist or environmental CEO like I have many times, and you will get the shock of your life. Usually I get a blank stare when I ask what process are you using to solve your problems. Sometimes they do a little better. They swear they are following an appropriate process (but they really are not), or they will react as if the question doesn't matter at all, or that you've got to be kidding, we don't need a process, we know what we're doing, and so forth. A simple process can be defined by listing the steps and describing them, along with related practices. Only once a process is formally defined can it be managed well. 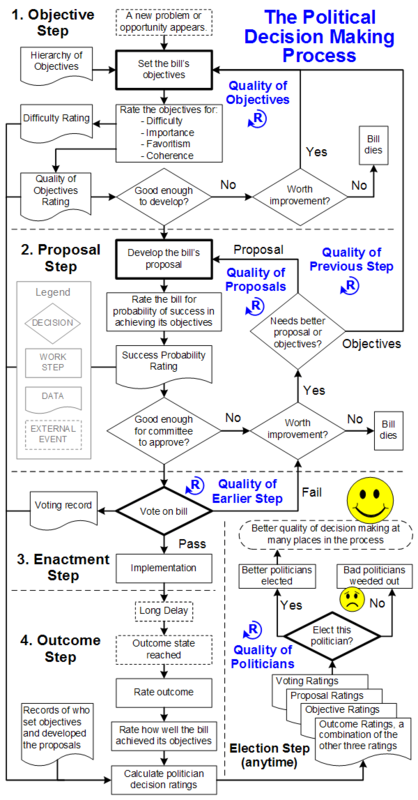 This process map is part of Politician Decision Ratings, a sample solution element in the Common Property Rights: A Process Driven Approach to Solving the Complete Sustainability Problem book. It explains how the process works in a manner easily understood by all. It includes the important feedback loops that the process adds. These are currently missing, which is why political decision making systems do such a poor job on their difficult problems, such as sustainability, avoiding recessions, etc. What process are you using to solve your most important problems? Do you have your process mapped? If you're with an organization, do you have a Process Center that's responsible for managing the organization's central process and continuously improving it? If you're convinced that a process that fits the problem is the key to problem solving success, then please see process driven problem solving. Can You Spot the Flaw in This Process Map? 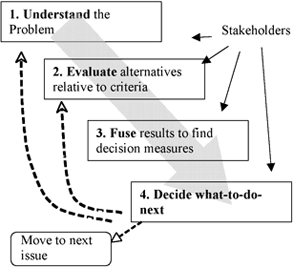 This high level process map is from a page on Understanding Decision Making Process Steps with the Help of Robust Decisions. The page defines step 1 as "In order to understand the problem you must clarify the issue, generate alternatives that resulted and develop criteria or attributes of the alternatives that will be used to evaluate and compare the alternatives." Can you spot the flaw in this process? There's no analysis step. "Clarify the issue" is not analysis. Thus the alternatives are plucked out of thin air intuitively. Missing is step 1.5 Analysis. Step 1 should be Define the Problem. Step 3 should be Generate Alternatives Using the Analysis. Skipping a true analysis step is an easy mistake to make, because most people, managers included, make decisions intuitively. It works fine on easy problems. But it fails on difficult problems because they require detailed high quality analysis to find the well hidden features of the problem that are required to generate high quality alternatives. The most important feature is a problem's root causes.